The idea for Coastal Upcycling came about as part of a high school commerce class. Some amazing local business people put up some funds and challenged commerce students to come up with a product to be promoted through their business, the Surf Collective. In a ‘Shark Tank’ style competition, I was lucky enough to win not only some start-up funds (which have been partially used to upgrade my tools), but they’ve also acted as mentors, which has been fantastic for me. I’m a Sydney Northern Beaches girl who loves anything that challenges me, and keeps me outside. I’ve been a competitive skateboarder for about five years now, and I also surf just for the fun of it. I also drive my parents crazy because I want to recycle anything and everything! As a skateboarder, I go through skateboard decks. No matter how well you treat your equipment decks get trashed. Skateboard decks are typically made from Canadian Maple, and when I thought about the millions of decks in Australia alone, going to landfill each year it did not sit well with my environmentalist soul. I toyed with a few items for surfers, but ultimately decided to take on the plastic surfboard wax combs. For those of you who do not surf, wax combs are used to make surfboards ‘grippy,’ so we don’t fall off our boards . . . ok we still fall off, but we don’t slip off as easily when our boards have a nice layer of wax. Wax combs are typically made out of plastic and are so cheap that surfers would not be devastated if they lost one. By making the combs out of recycled skateboard decks, they could become a functional piece of art that environmentally aware surfers would actually value. The combs are all hand-crafted, and each is unique in size, shape, and colour. Some retain bits of the original graphic, some still have grip tape (that is essentially sandpaper for non-skateboarders and serves the same purpose as the wax on surfboards), and some are sanded down to show the colour layers that are found in many decks. 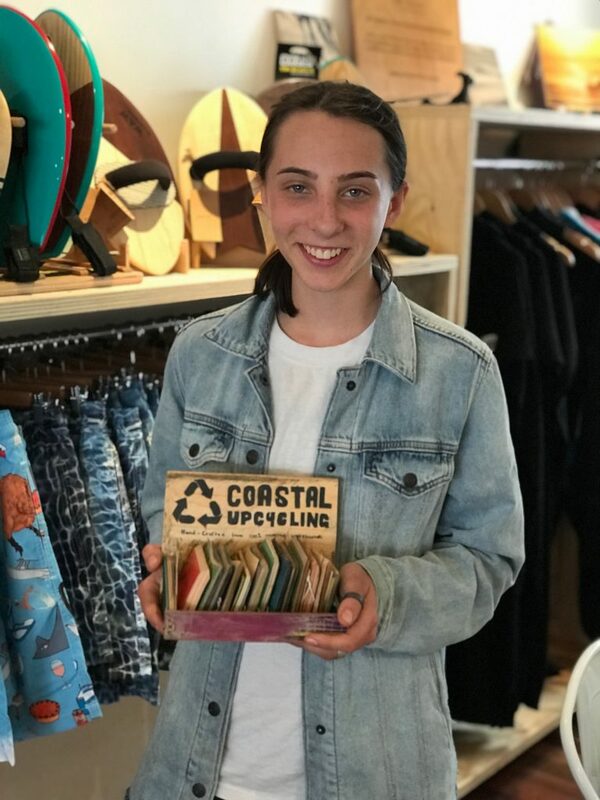 If you or a surfer you know is passionate about the environment, I invite you to check out Coastal Upcycling‘s product range. If you have any ideas for additional products, please feel free to contact me via the Contact page.